Greetings Programs! I'm from Opera 12.64. Is it even worthwhile to drop by to say hello? Have they fixed Opera yet so it's not a chrome clone? Have they even bothered to try to integrate these things yet? I'd let personal layout customizations go, but those top four are the most important. Check out the forum rules and use the forum search before posting flame-bait threads. • Rules of Conduct (Don't post inflammatory threads). Opera 12.64 does not exist. I guess you mean either Opera 11.64 or 12.16. We expect to see these features return sometime around version 73, in the year 2025. • Rules" target="_blank">http://my.opera.com/community/forums/findpost.pl?id=659913]Rules of Conduct (Don't post inflammatory threads). I'm a big fan of Opera, and no, I don't think that I'm flame baiting. Mouse gestures I uses every moment. Keyboard shortcuts I use every moment. Nicknames for bookmarks I use every moment to access the hundreds of bookmarks that I remember by simple keyboard shortcuts. If there is any baiting going on it would have been me beleiving that opera would be built around a webkit engine, and not just an opera clone like dragon, iron, and a million other chrome clones. In fact, opera chrome works worse that the other chrome derivatives which means that opera has completely abandoned what makes it unique. Another one for the Ignore file. "Some of these missing features will come back, some will be available through extensions, but there is no expectation that extensive customizability will return as it was before"
"The company intend to offer more features to our users than Google Chrome offers. In same time we don't want to do hard work on stuff that nobody will use"
"We absolutely disagree with a negative feedbacks on suspected "cloning" of Google Chrome. Now we are Blink's developers just like Google"
"As for the similarity of Opera and Chrome, an average users shouldn't feel the difference here, at least because of browsers icons are different"
The company intend to offer more features to our users than Google Chrome offers. 1. Extensive customizability will neither return nor otherwise exist. 2. Extensive customizability will return, but only in part. 3. Extensive customizability will exist, but be significantly different than before. My bet is on #1 or #2. The irony is that what made older versions of Opera so useful to such a wide range of people was its very customizability... any kind of user could bend it to support their particular needs. But just like so many consumer items these days, it's likely Opera will now have "no user serviceable parts inside"... or at least, very few. Welcome to a world of three or four flavors of vanilla... and little else. I wonder how many users are still using 12.6 like myself or just left and started using a different browser like I am planning on doing? Im planning on keeping it for now... and wait for the bookmarks (opera link) and keyboard shortcut. If after opera 20-22 (problems to load some pages like YOUTUBE or DotaCash wtf o_O) it doesn't have it, ill probably drop everything and go to firefox or baidu or chrome (since it look to have exactly the same retarded boring features). I'm following the development of Opera to see if it evolves back into something I can use as my default browser, but I'm slowly starting to transition over to Firefox. I added extensions to Firefox 25 to replicate the functionality I need/use in Opera 12.16. In fact, it does some things better than Opera 12.16 does, but obviously it depends on your needs. Opera Next doesn't come close to fulfilling my needs, I know that much. Without doubt this seems to be Opera's biggest problem. 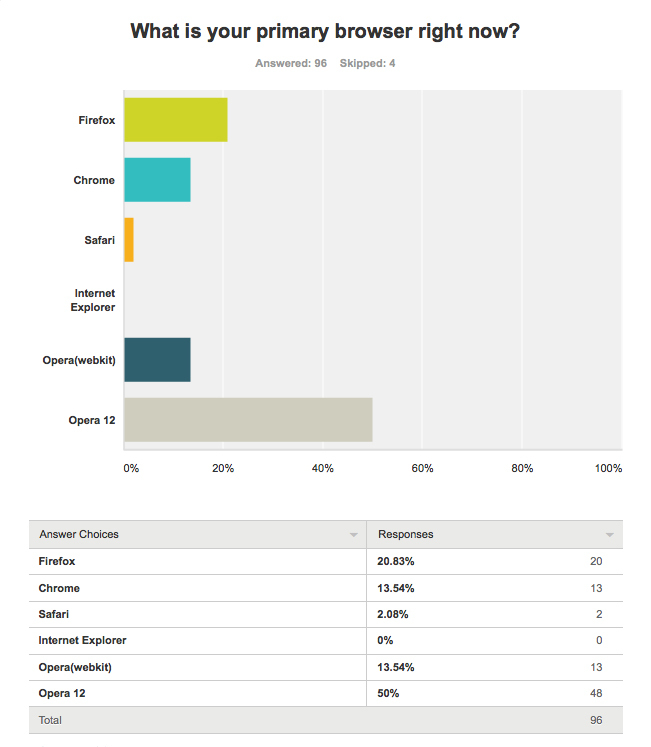 Most people still use opera 12, quite a few moved to firefox and chrome, and only 13% is using opera chrome. Statistics are an interesting thing. You can make them say pretty much whatever you choose. The truth is, we don't know what most Opera users are doing. If you were to count all of the negative posts in the various threads posted on this forum it would only amount to a few thousand and even that is deceiving since many of those are repeats by the same posters. Opera users worldwide number in the millions and the truth is, we don't know what they are using or thinking. It's simply too early to make predictions. I'm still using 12.16 like many users. Considering all which has been said, Opera has fallen (which is dreadfully sad). I can't even recommend it to people anymore. The decision-makers (new ones?) at Opera Software clearly made a terrible and absurd mistake. "I can't even recommend it to people anymore." My main reason for abandoning firefox all those years ago, was that you needed too many extensions to have what I considered to be basic features. And because each extension is developed independently, when combined with the browsers core functions, they tended to hog too much RAM and processor power. I don't want to go back to that. Not for something as basic as being able to delete a specific site's cookies, or setting up a proxy server in opera alone. Or extend the amount of time before a page times out. I feel like I've gone from an SLR to a point-and-shoot camera. Funny thing about todays point and shoot cameras. They seem to do the job very well, they're far more popular and they're portable. It depends on the job you want done. . . and what you consider to be "well".